Vicky was living with his parents in a small town. His father was a magician. One day, Vicky's school teacher taught about dinosaurs in the class. Vicky and all the other children in the class were excited to to know about dinosaurs. That evening Vicky told his father about dinosaurs and asked if he could bring a dinosaur for him using his magic power. At first, Vicky's father refused to do that but on seeing Vicky feeling very sad, his father using his magic power created a small dinosaur and presented him. Vicky was very excited about his new pet. He named the little dinosaur 'Dino'. Dino too loved Vicky. 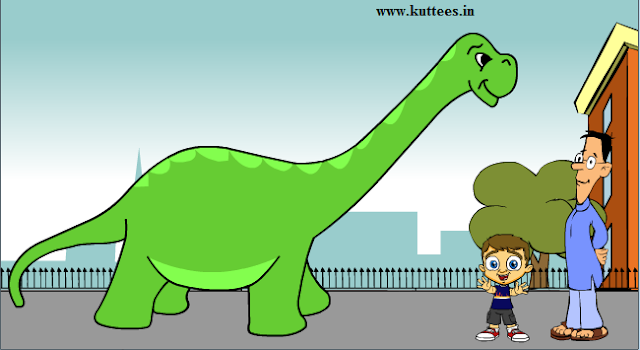 Vicky took Dino with him to the play ground where his friends were playing. There Vicky introduced Dino to all his friends. All his friends were excited to see a dinosaur. They all played together.